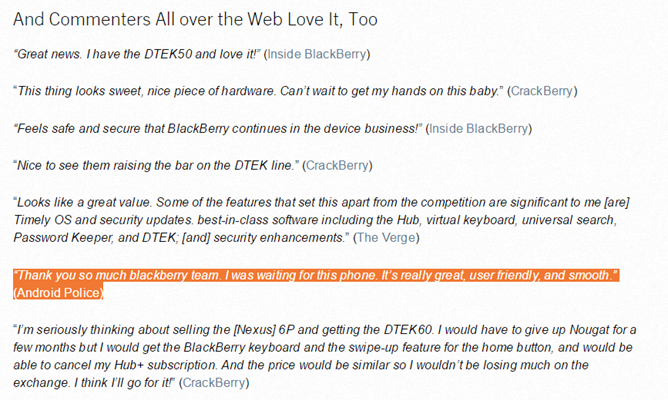 It seems BlackBerry has removed the Android Police comment quote from its blog post. It was fun while it lasted. 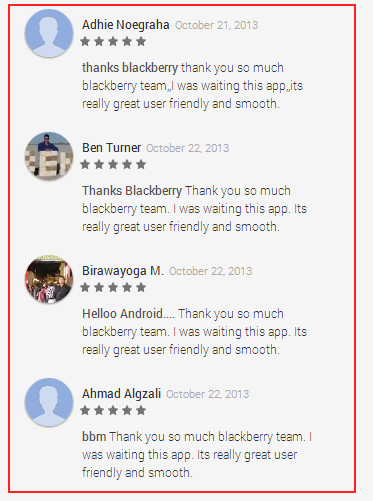 Thanks BlackBerry - thank you so much BlackBerry Team its really great user friendly and smooth. The same review was left over and over, with little variation. Clearly someone was stuffing the ballot for BlackBerry, and since it really didn't make sense for anyone except BlackBerry to do so, suspicion instantly fell on the company and/or its contracted marketing and public relations partners. Though BlackBerry did respond to our short report ("We do not approve of or condone such activities"), the company never explained exactly what happened. The easy assumption is that some over-eager promoter decided to make damn sure that BBM was a success on Android and paid people via some relatively cheap labor service, such as Amazon Mechanical Turk, to pump up the app's score. To be clear, that hasn't been proven in any way, it's just the explanation that makes the most sense. Now fast forward to 2016. BlackBerry is in even more dire straits now than it was then - the company is no longer making its own hardware, instead loading up a customized, security-focused ROM onto white box phones such as the Alcatel Idol 4 to make "BlackBerry" products like the DTEK50. The newest device is the DTEK60, a bigger and more powerful option based on the TCL 950 handset. It's on sale now for $499. Android Police reported on the phone launch yesterday, as usual. Apparently BlackBerry couldn't wait for initial reviews to toot its own horn, and instead decided to publish a blog post documenting the overwhelmingly positive press that the DTEK60 received just hours after being announced. 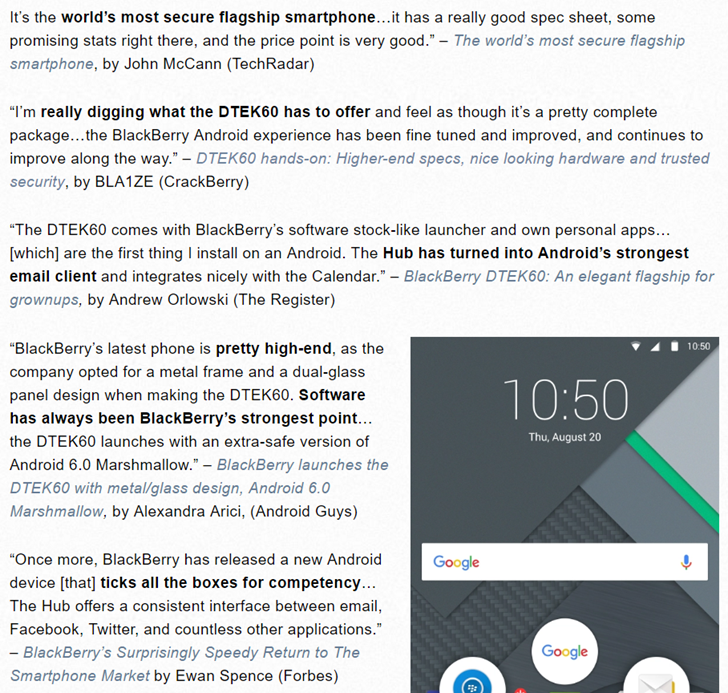 The breathless post quotes technology sources like TechRadar, CrackBerry, TechCrunch, and SlashGear. This sort of thing isn't uncommon - it's kind of like those movie commercials you see with reviewer quotes boasting about "the blockbuster hit of the summer" and such. But that wasn't enough. Nope, the blog post quotes technology fans on Twitter and Instagram, all of whom praise the rebranded phone as if it's the long-prophesied return of the Half-Life franchise. This sort of thing isn't unheard of either - hell, it's half the reason that brands have Twitter accounts in the first place - but giving equal billing to both individual social posts and established media is a little weird. It reeks of desperation... which I suppose makes sense, in context. You wanted a bigger, powerful & secured Android Smartphone. @Blackberry has answered your prayers. 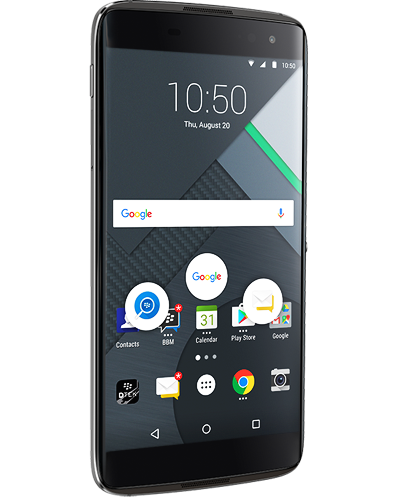 #DTEK60 | Go get it. But even that wasn't enough to sate BlackBerry's lust for positive buzz. Next, they scraped the user comments of some of those news posts for positive reactions to the DTEK60's announcement. This seems particularly low, since they're primarily pulling from Inside BlackBerry and CrackBerry, sites whose users can be relied upon to at least have a moderately pro-BlackBerry slant. The blog post also pulls one comment each from the more general tech site The Verge... and Android Police. Well my my, doesn't that look familiar. That is in fact a comment left on Android Police's DTEK60 announcement post. And it's not technically fake... at least, not in the sense that it was left by some BlackBerry shill. The comment was posted by one of our readers going by "Samarth." Samarth is a real guy, and he's posted on Android Police articles before going back months. Samarth was just sarcastically and humorously calling back to the original 2013 story about the fake reviews, leaving the identical comment. It's a joke. It's not intended to be a genuine expression of desire for the DTEK60. I'm over-explaining this, aren't I? 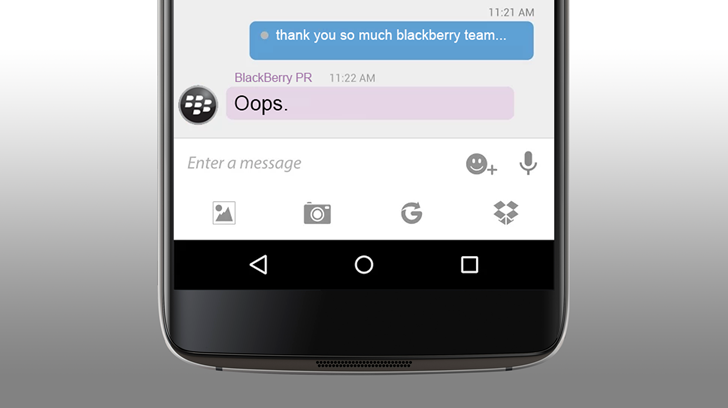 Anyway, the joke apparently went over the head of someone on the BlackBerry PR team, as they included it as if it was real praise from an excited prospective customer. Or did they? I don't wish to accuse anyone of foul play. But it is odd that out of the seven blog comments cited by BlackBerry, three from Inside BlackBerry, two from CrackBerry, and one each from The Verge and Android Police, ours is the only one without a direct link to the comment in question. Huh. What's also strange is that it wasn't the only positive comment on the article - a reader going by "atc-tech" says that "I would buy THIS right now, over the Pixel XL." 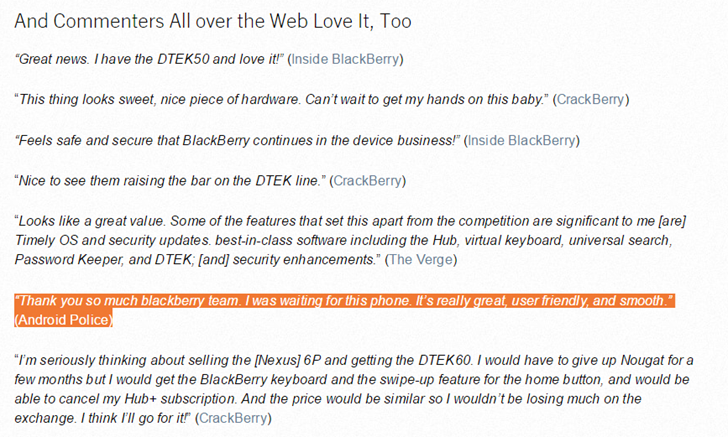 BlackBerry's blog post is self-congratulatory to the extreme. It's sad and reaching enough all by itself - quoting Twitter, Instagram and blog comments that haven't been verified to be independent is kind of weird. But adding a sarcastic comment referring back to an embarrassing example of a PR gaff just turns the whole thing into a farce. We hope you're having as many laughs at BlackBerry's expense as we did. For more peeks behind the curtain at the world of PR, check out this sympathetic report.